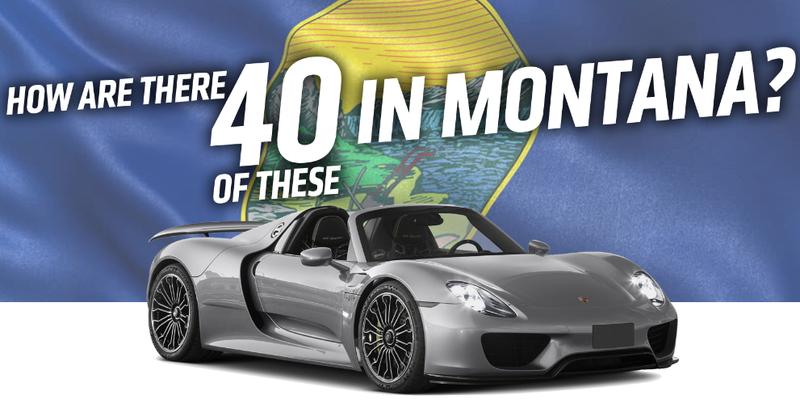 For years, many exotic car buyers have been registering their cars in Montana thanks to a loophole in the law that allows them to avoid paying sales tax. Now, according to local news site Bozeman Daily Chronicle, that may all come to an end with the “Ferrari Tax.” Here’s a look at the cars that will be affected, as well as the tax they’d have to pay if this bill goes through. Up until now, many exotic car owners have gotten around sales tax by simply registering their vehicles with law firms that create special Limited Liability Companies. Now, as a part of House Bill 650, owners of exotic cars valued at over $150,000 may soon have to pay a one percent annual tax. This “Ferrari Tax,” Bozeman Daily Chronicle says, could raise up to $2.5 million in 2018, and even more in subsequent years. Acura NSX, 10 vehicles valued at $180,000 apiece, with total fees of $16,200 charged to all 10 vehicle owners. Aston DB11, three vehicles valued at $215,000 apiece, with total fees of $5,805. Aston DB9, one vehicle valued at $200,000, with a total fee of $1,800. Aston Rapide, one vehicle valued at $210,000, with a total fee of $1,890. Aston Vanquish, five vehicles valued at $290,000 apiece, with total fees of $13,500. Audi R8, 14 vehicles valued at $160,000 apiece, with total fees of $20,160. Bentley, 40 vehicles valued at $220,000 apiece, with total fees of $79,200. Bentley Mulsanne, five vehicles valued at $300,000 apiece with total fees of $13.500. Bugatti Grand Sport Vitesse, one vehicle valued at $2.2 million, with total fees of $19,800. Ferrari 458, 27 vehicles valued at $240,000 apiece, with total fees of $58,320. Ferrari 458 Speciale, 49 vehicles valued at $270,000 apiece, with total fees of $119,070. Ferrari 488, 79 vehicles valued at $250,000 apiece, with total fees of $177,750. Ferrari California, 34 vehicles valued at $200,000 apiece, with total fees of $61,200. Ferrari F12, 49 vehicles valued at $300,000 apiece, with total fees of $132,300. Ferrari FF, nine vehicles valued at $300,000 apiece, with total fees of $24,300. Ferrari F60, two vehicles valued at $2.5 million apiece, with total fees of $45,000. Ferrari Laferrari, 14 vehicles valued at $1.5 million apiece, with total fees of $189,000. Koenigsegg Agera One 1, one vehicle valued at $2 million, with total fees of $18,000. Lamborghini Aventador, 55 vehicles valued at $400,000 apiece, with total fees of $198,000. Lamborghini Huracan, 83 vehicles valued at $200,000 apiece, with total fees of $149,400. McLaren 650, 31 vehicles worth $350,000 apiece, with total fees of $97,650. McLaren P1, 23 vehicles worth $1.15 million apiece, with total fees of $238,000. Mercedes S550, 84 vehicles worth $190,000 apiece, with total fees of $143,640. Mercedes S600, four vehicles worth $190,000 apiece, with total fees of $6,840. Porsche 918, 40 vehicles valued at $850,000 apiece, with total fees of $306,000. Pagani Huayra, four vehicles valued at $2.5 million apiece, with total fees of $90,000. Rolls Royce Dawn, 18 vehicles valued at $340,000 apiece, with total fees of $55,080. Rolls Royce Ghost, nine vehicles valued at $300,000 apiece, with total fees of $24,300. Rolls Royce Phantom, 16 vehicles valued at $430,000 apiece, with total fees of $61,920. Rolls Royce Wraith, 21 vehicles valued at $300,000 apiece, with total fees of $56,700. Forty Porsche 918s? Four Pagani Huayras? Eighty-Three Huracans? Twenty-Three McLaren P1s? Good god, I know Montana has some rich natural resources, but damn: people are clearly milking this tax loophole. And if this bill goes through, Montana is set to make out like a bandit.